Christopher Columbus was served a dish containing powdered chili peppers and perhaps still thinking he had arrived in the East Indies, thought it was from from true Asian peppercorns and misnamed the pepper plant. Peppers are members of the nightshade family, which also includes potatoes, tomatoes, tomatillos, eggplants, tobacco and petunias. Peppers are tropical perennial fruits – not vegetables – and can live for many years. Obviously, they have to be brought inside for the winter here in Minnesota, but I think pepper plants are pretty and I wouldn’t mind them as houseplants. Peppers are divided into two basic groups: sweet, mild-flavored peppers -- generally used as a vegetable, and hot peppers, most frequently used as a seasoning. All peppers are technically "chili peppers" but most people associate the "chili" adjective with the hot peppers. The fire roasted canned chili peppers available in the stores are generally poblano or Anaheim peppers. The color of a pepper is an indication of its maturity, not the heat. For example, jalapeños are generally green in the store but will turn red if left on the vine longer. They are actually sweeter when fully ripe, not hotter. The degree of “hotness” of peppers is caused by the chemical compound, capsaicin, which is found in the membranes that surround the seeds, not the seeds themselves. Capsaicin is the active ingredient in pepper spray. When capsaicin comes in contact with skin, eyes or mucous membranes it causes a painful burning sensation. Breathing in the small particles of the spray can even cause breathing difficulty. Sprays made with hot peppers can be used as protection from attack either by people or bears. Pepper spray will also protect garden plants from midnight munchers who will avoid the capsaicin. Ironically, birds are not bothered by capsicum at all, so ground or crushed dried chili pods can be added to the birdfeeder to deter squirrels. The degree of heat in peppers is measured on the Scoville scale which was created in 1912 by American pharmacist Wilbur Scoville. The scale goes from the bell pepper with 0-100 Scoville Heat Units (SHU) to pure capsaicin at 15,000,000-16,000,000 SHU. Habanero peppers are generally 100,000-350,000 and cayenne and Tabasco peppers are in the 30,000-50,000 range. The reason for the varying measurement is because the hotness of a pepper is affected by cultivation – type of soil, weather and amount of water. Fire roasting peppers is not as challenging as it sounds. This is the process of charring the skin to make it easy to remove, very like scalding tomatoes or peaches to remove the skin. Some people prefer to do this on a grill for the added flavor but it can also be done by placing the pepper directly on a gas burner or under the broiler in the oven. Roast them quickly with very high heat to sear the skin being careful to not cook the pepper. As they blacken turn the peppers to char all sides. When the peppers are blackened and blistered remove them from the heat and seal them in a resealable plastic bag or a covered bowl for 10-20 minutes. This "sweating" process helps to loosen the skin. When the peppers are cool enough to handle, slip the skin off. Remove the core and the seeds and proceed with your recipe. A tip I learned the hard way -- make sure you are just searing the skin and not cooking the pepper. If your heat is too low the pepper will cook as the skin is charred and you will be left with a mushy, slimy pepper after you remove the skin. Not good. Bell peppers get their name from their bell-shape…although that may be a bit of a judgment call on the appearance. Bell peppers are the most mild and sweet of all the peppers, ranging from 0-100 on the Scoville scale. Green bell peppers are harvested before they are fully ripe so they do not take as long to produce making them less expensive than the colored bell peppers. If green peppers are left on the plant they will eventually turn yellow, orange or red depending on the variety. 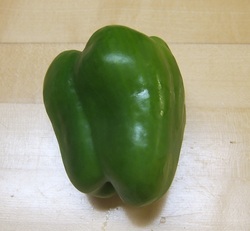 Not surprisingly, the less ripe green peppers are not as sweet as the more mature red, yellow or orange peppers. Pimento and paprika are both made from red bell peppers. Not only are the ripe peppers sweeter, they also contain more nutrients than the green pepper. A large green pepper has 220% of the daily value of vitamin C, a large red pepper has 349%, but a large yellow pepper has 569% of the daily recommended value of vitamin C! No daily value requirement has been established for beta carotene but one cup of green pepper provides 340 mcg. One cup of red pepper has 841 mcg but in this contest the yellow pepper trails with only 110 mcg. Beta-carotene is converted into vitamin A in the body. Bell peppers are also a good source of vitamins E, B6 and K, antioxidants which help neutralize free radicals that cause cell damage that can lead to inflammation, heart problems and cancer. While red bell peppers contain larger amounts of antioxidants, green bell peppers are a significant source as well. Other minor elements in peppers such as lutein and zeaxanthin, may slow the development of eye diseases, such as cataracts or macular degeneration, later in life. Lycopene has been shown to lower the risk of some types of cancers. And, of course, fiber. There are 2.5 grams of fiber in one cup of green bell peppers, approximately 8% of the daily recommendation. Cut the beef into strips 1 x ¼ inch and brown in oil. Add water, onion, garlic and ginger. cornstarch and soy sauce together and stir into beef. Cook, stirring constantly until thickened. Wedge the tomatoes and place on top until heated through. Serve with rice. Brown hamburger and onion just until the meat is no longer pink. Drain. Bring a large pot of salted water to a boil and cook the peppers for 2-3 minutes. Fry the hamburger and onion. Drain. Mix the hamburger with the rice, salt, pepper and ½ of the tomato sauce. Stir in ½ of the cheese. Fill the peppers with the mixture and pour the remaining tomato sauce on top. Sprinkle with the remaining cheese. Put about ¼ inch of water in a baking dish, place the peppers in the water and bake at 350° for 30 minutes or until the pepper is tender and the meat is heated through. One of the unexpected benefits of this farming experiment has been getting to know old friends in a new way and meeting new people -- sharing lots of ideas and recipes. Such is the case with the following. Gale Husom introduced me to Michele Schoenecker and Michele shared the following recipe. Joel tried it and sounded surprised when he said it was good...I don't think he expected that. Slice and seed the peppers and quarter the onions. Put the vegetables on a cookie sheet and drizzle with olive oil and sprinkle with kosher salt. Bake at 325° for 1-2 hours or until vegetables are soft. Cool slightly and process in a food processor or blender until smooth. Rewarm the soup and blend in 32 oz tomato juice. Drizzle with cream to serve. Slice the peppers into thin strips, 2 inches long. Heat oil in frying pan and heat until it glistens. Add the onion and stir-fry for about 1 minute. Add the garlic, and then gradually add the peppers. Continue to stir-fry for about 5 minutes longer, until the vegetables are tender. Add balsamic vinegar and season to taste with salt and pepper. Sprinkle on as much basil as desired and stir in briefly, just to heat through, just before serving. . The Jalapeño pepper is named for its place of origin. The Spanish suffix -eño is like the “–an” at the end of a location in English signifying the place of origin, such as American, Minnesotan or Norwegian. The Jalapeño Pepper is named after the town of Xalapa (also spelled “Jalapa”) in southeastern Mexico. It originated there but as of 1999, there were over 5000 acres of Jalapeños grown in the United States, mostly in southern New Mexico and West Texas. Jalapeños have anywhere from 2,500 to 10,000 Scoville Heat Units. Handling fresh jalapeños may cause skin irritation because of the capsaicin so it’s a good idea to wear gloves while preparing raw Jalapeño peppers and avoid any contact with your eyes or nose. Chipotle peppers are fully ripened (red) jalapeño peppers that have been smoked for several days until they are completely dried. Wearing latex or vinyl gloves, slice jalapeños in half lengthwise and scrape out the seeds. Set aside. Combine cream cheese and the cheese of your choice: Cheddar, Monterey Jack or a Mexican cheese mixture and stir until well blended. Use a spoon to fill each pepper half with the cream cheese blend. Add salt, pepper, paprika, chili powder, and garlic powder to the flour. Dip the stuffed jalapeño in the milk and then roll in the seasoned flour. Let the peppers sit for about 10 minutes for the flour and milk to dry on to the pepper. This helps seal in the stuffing. 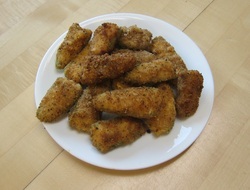 Dip floured jalapeno pepper into the milk again and then into the bread crumbs. Let them dry about five minutes and then repeat the process of dipping them in milk and then into the bread crumbs. 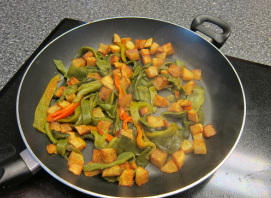 Fry peppers in medium hot oil for about two minutes or until golden brown. Drain and serve. Poblano peppers are mild peppers originating in the state of Puebla in Mexico. They have thick, dark-green skin and a wide base that tapers to a point. When the ripe poblano is dried it is called an ancho or ancho chile, from the Spanish ancho which means "wide" or chili ancho meaning "wide chili.” Poblanos tend to be mild but like other peppers they can vary and occasionally be hot. When ripened to red they are hotter and more flavorful. Poblano peppers register between 1,000 and 2,000 Scoville heat units on the Scoville Scale. Poblanos are often roasted or charred and peeled. 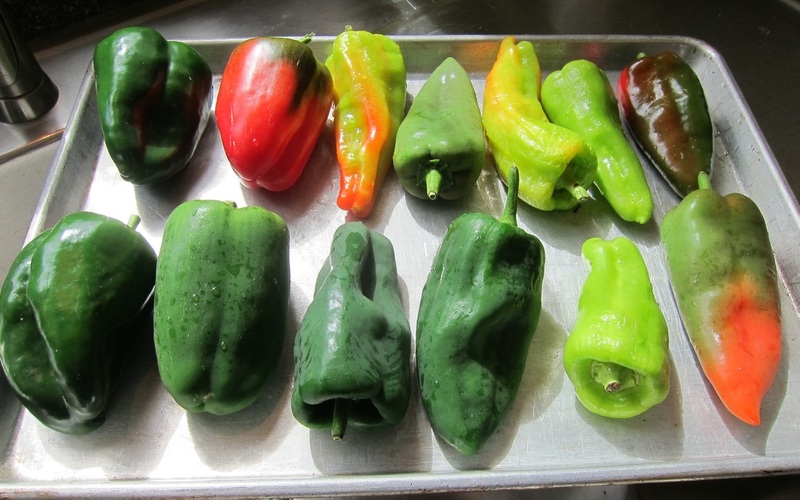 Choose straight and flat peppers because they will roast more evenly than those that have a curl to them. Peppers can be roasted over an open flame but it is more convenient to char them in the oven under the broiler. Position the oven rack 4 to 6 inches below the heating element of the broiler and preheat to 425°. Rinse and dry the peppers, arrange them in a single layer on an aluminum foil-lined baking sheet and place them under the broiler. Roast the peppers until the skin is charred and blistered, about 3 to 4 minutes. (They shouldn’t be completely black, just 60% to 70% charred). Flip the peppers over and broil on the other side until that side is also charred and blistered, another 3 to 4 minutes. Remove the peppers from the broiler and place them in a heat-safe bowl. Cover the bowl, and let it stand for 10 to 15 minutes to steam. The steam will help loosen the peel from the peppers. When they are cool enough to handle the filmy peel should slide off. Roast the peppers directly over a flame (such as a burner on a gas stove) or in the broiler turning occasionally with tongs, until blackened and blistered on all sides. Put hot peppers into a bowl sealed with plastic wrap until cool enough to handle. The charred skin should be easy to peel. Carefully slit the pepper and remove the seeds, season with salt and pepper and stuff with the cheese and "pin" shut with a toothpick. Heat the oil. Beat the egg whites until stiff peaks form. Beat the yolks with the flour. Gently fold the yolk flour mixture into the egg whites. Test the oil temperature. If a drop of batter sizzles and floats to the top, the oil is ready. If the batter sinks, the oil is not hot enough. Drop about ½ cup of the eggs into the hot oil and place one of the stuffed peppers, seam side down on the egg. Drop more egg mixture on top and "frost" the pepper with it. Fry until browned and set on the bottom and then carefully turn the pepper over to brown on all sides. Remove the pepper and drain. Place in a warm over and repeat with remaining peppers. Mix together cornmeal, flour, chili powder, cumin, salt and pepper. Set aside. Seed and chop the pepper finely. Heat the oil in a large pot over medium heat. Add onion, ½ cup poblano pepper and garlic. Sauté until the onions are translucent (about 5 minutes). Add butter or margarine. When the butter has melted add the flour, cornmeal and spices, stirring constantly until well mixed and thickened. Slowly add the chicken stock, stirring, until combined. Add the half-and-half and bring to a slow simmer. Simmer 10 minutes. Do not boil. Stir in chicken to heat through. 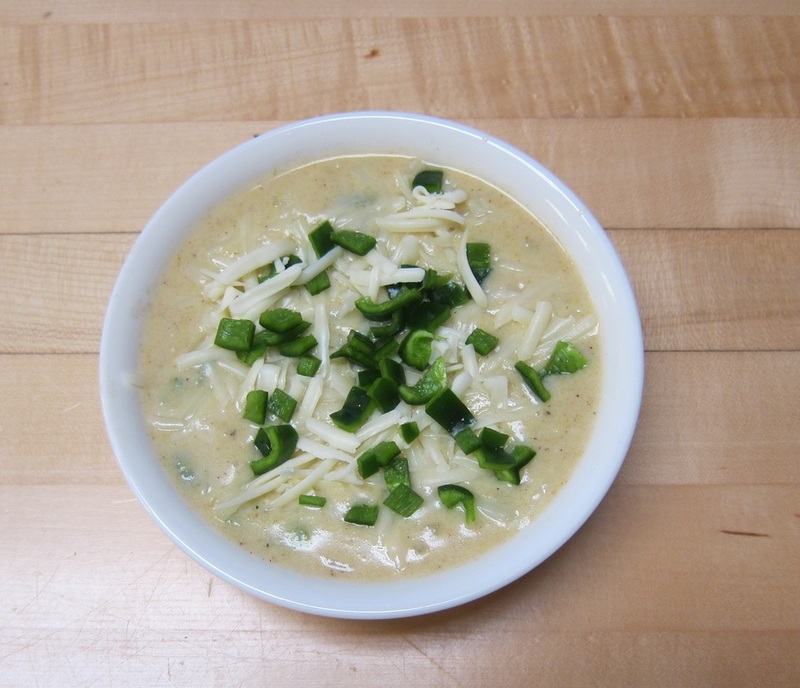 Garnish with cheese and remaining ½ cup chopped pepper. Serves four. Heat the oil in a large skillet over medium-high heat. Add the poblanos and onion and cook, stirring often, until the poblanos are blistered in spots, 4 to 6 minutes. Add the corn, garlic, 1 teaspoon salt, and ¼ teaspoon black pepper and cook, stirring often, until the corn is heated through, 2 to 3 minutes. Mix in the lime juice. Anaheim peppers are more slender than Poblanos. 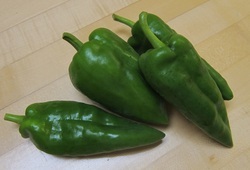 They are a lighter green color and have a fruitier flavor but they are also used for making chili relleno, probably because they are large enough to stuff and because they have a roughly the same SHU rating as poblanos. Anaheims typically range from 500 to 2,500 SHU. The Anaheim peppers (aka New Mexico Chilies) grown in New Mexico tend to be hotter than those from California. New Mexican varieties and range from 500 to 10,000 SHU. The Anaheim pepper actually originated in New Mexico, where they are known, not surprisingly, as New Mexico chilies. The name "Anaheim" came from Emilio Ortega, a farmer who brought the seeds to Anaheim, California, in the early 1900s. The company still bears his name. Anaheim peppers are the kind of peppers used in canned green chilies. This recipe came from my daughter and son-in-law who are particular about the authenticity of Mexican food. Roast, peel, seed and core the peppers. Cut or tear them into strips. Boil the potatoes 10-12 minutes. Peel and cube potatoes. Heat several tablespoons of oil in deep frying pan. Add the potato cubes and salt generously. Fry, stirring occasionally, until golden brown. Remove the potatoes from pan and add rajas. Salt the peppers and cook them a couple of minutes, stirring occasionally. Return the potatoes to the pan and heat through. Serve with sour cream, crumbled queso fresco and salsa. *Queso fresco is a white, mild, fresh cheese that is available in most grocery stores. If you prefer, you can substitute another mild white cheese such as mozzarella.